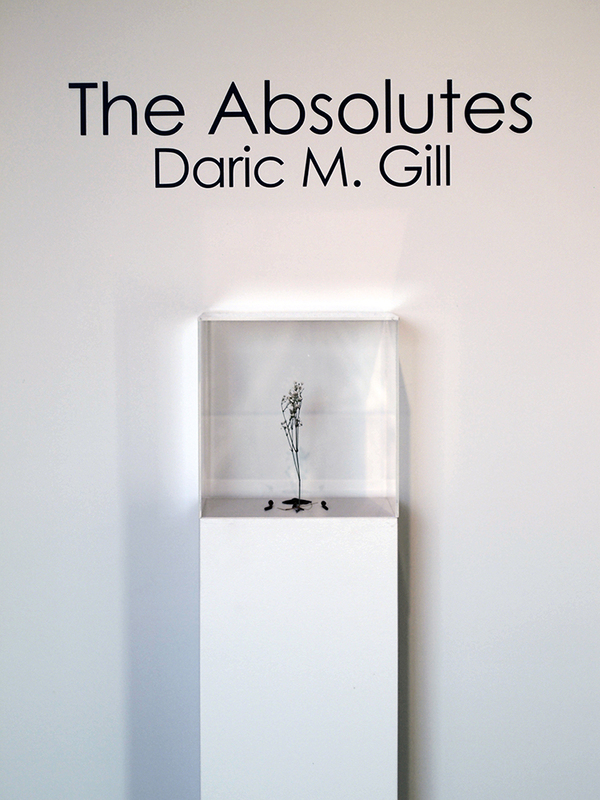 A few days ago, The Absolutes opened at the Schumacher Gallery among giants like Warhol, Chagall, Nevelson, Picasso, and Calder. Also debuting with The Absolutes are 5 new sculptures made from small found objects used in my paintings; arranged much like how they’d exist during an in-studio painting session. Rich with symbols, each artwork feeds off the others in the exhibition. Now they reach into the three dimensions through these found-objects artifacts. Flanking The Absolutes is a wide array of African, Inuit, Asian, and European artwork spanning over 2,000 years. All works are part of a massive donor-based museum collection. Absolute: Separation, 8 1/4″ x 17″. Oil on oak panel. 10.8.13. “Arrangement #3”, Schumacher Gallery. Honey locust thorn, thread, two nails, dried rose, dried babysbreath. “Arrangement #3” (detail), Schumacher Gallery. Honey locust thorn, thread, two nails, dried rose, dried babysbreath. “Absolute: Insulation” (detail), Oil paint on reclaimed cherry wood. 12 3/4” x 15 5/8”. 12.13.16. “Arrangement #2”, Schumacher Gallery. Green hawthorn branch, dried gingko leaf, 3 green hawthorn berries. “Arrangement #2”, Schumacher Gallery. Green hawthorn, dried gingko leaf, 3 green hawthorn berries. “Arrangement #2” (detail), Schumacher Gallery. Green hawthorn branch, dried gingko leaf, 3 green hawthorn berries. Absolute: Allure, Oil on reclaimed birds eye maple. 7 11/16″ x 8 3/4″. 6.4.15. Absolute: Plumb: oil on panel. 12″ x 24″. 2.21.12. Absolute: 1: oil on panel. 12″ x 13 1/2″. 11.5.12. “Arrangement #1” (detail), Schumacher Gallery. Two dried gypsum weed stalks, wish-bone twig, thread, green hawthorn berry. “Arrangement #1”, Schumacher Gallery. Two dried gypsum weed stalks, wish-bone twig, thread, green hawthorn berry. Absolute: Centered, Oil on reclaimed red oak barn wood. 14 3/4” x 13”. 6.10.15. “Arrangement #5” (detail), Schumacher Gallery. Osage orange branch, dried rose, plumb bob, bone, paper, cotton string. “Absolute’s Complement” Oil on panel. 11 5/8″ x 17 3/8″. 6.16.12. “Absolute’s Complement” (detail) Oil on panel. 11 5/8″ x 17 3/8″. 6.16.12. “Absolute: Denial”: Oil on reclaimed panel. 12 1/2″ x 12″. 1.12.14. “Absolute: Denial” (detail): Oil on reclaimed panel. 12 1/2″ x 12″. 1.12.14. “Arrangement #4”, Schumacher Gallery. 2 dried gypsum weed pods, 2 dried gingko leaves, 2 railroad spikes, & paper with thread. Absolute: Radiance: Oil on reclaimed quilted walnut. 11 3/8″ x 8 1/2″. 6.14.13. “Absolute’s Complement: Asymmetry”: oil on panel. 10 1/8″ x 7 3/4″. 7.1.12. Love the large round one when greeting the gallery. Congrats! Thank you! It’s the newest piece and I felt it could really draw people in. I’m glad you also like the placement. Thanks!